This is an awesome new series of novels featuring the fanatical female warriors of the Adepta Sororitas. When a dangerous psychic terrorist escapes from their custody, the Sisters of Battle not only have to hunt down and recapture him, but also need to restore their honour in the eyes of their superiors. Armed with determination, faith and the best training and weaponry the Imperium has to offer, the Sisters will let nothing and nobody stand in their way. There are times when the scale of a daemonic infestation is such that even the most formidable and righteous Inquisitors need to call upon aid to triumph. 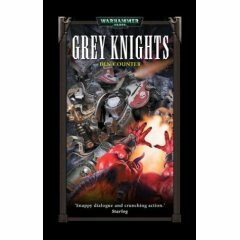 High speed action and adventure with the elite Grey Knights as they struggle to banish the powerful daemin Ghargatuloth before time runs out and the creature is free to rampage aroung the universe! Ben Counter's lates foray into the war-torn far future is packed with white hot action featuring the superhuman daemonhunters - the Grey Knights. From the epic clash between man and infernal daemon to the dark horrors of Chaos, Ben Counter hits the target on every level! The sequel to Ben Counter's massively popular "Grey Knights" brings back Captain Alaric and his brothers in an all-new adventure. When a planet that vanished a hundred years earlier mysteriously reappears, the Grey Knights are sent down to investigate whether it has been corrupted by Chaos. Packed with fast-paced action, "Dark Adeptus" pits the brave Grey Knights daemon hunters against the servants of darkness. There is full-on Space Marine action in the amazing sequel to "Warrior Brood"! The iconic Space Marines blast into action with all guns blazing in CS Goto's latest novel. The sequel to "Warrior Brood" explores the Deathwatch Space Marines and their remit to hunt down the foul alien creatures that besiege mankind from all fronts. Warrior Coven sees the Deathwatch being forced to ally with those they have sworn to destroy. Can they hold their fanatical hatred in check to prevent a bigger evil from entering the universe? 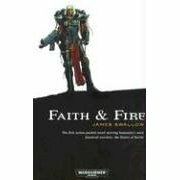 This action-packed novel from the author of "Dawn of War" brings the grim darkness of the far-future to life in an epic SF tale with an explosive climax.